After I retired from Williams, I decided it was time for a makeover of sorts. I don’t mean my look or my hair or even my wardrobe. It was all about my presence on the Web. My old website was functional but stale, and I wanted a site that was not just more beautiful, but one that would dynamically convey the range of my interests and abilities. I was lucky enough to find Camille Farey to design it. She has a great sense of aesthetics and an amazing eye for color. I didn’t expect that developing a new site would involve so much work on my part. I thought I’d just have to feed Cami the necessary material and she’d take care of the rest. But she taught me a lot about what it takes to create a successful website, one that communicates something beyond the mere facts. Creating the site involved a lot of soul-searching to come up with a self-presentation that didn’t feel either too modest or too much in your face. In pushing me to explore different aspects of my life, Cami’s enthusiasm was boundless. Not only did she take care of all the computer coding and other nitty-gritty tasks, she immersed herself in my work to get a fuller sense of what I do. One morning I woke up to a charming Instagram story she had made about her foray into baking. The video is so much fun that I want to share it here. 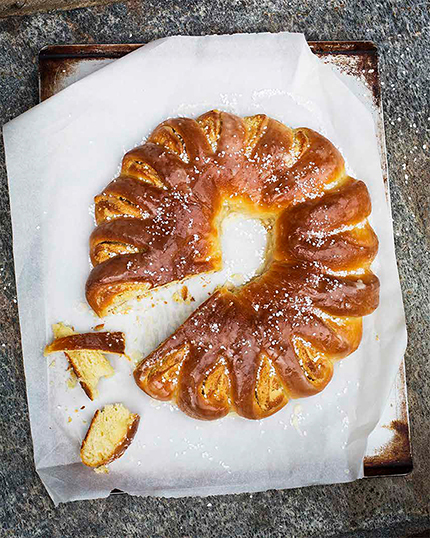 Seeing Cami make the Swedish Almond Wreath from my cookbook Fire + Ice proves that even novice bakers can create a gorgeous loaf from my recipe, which you'll find here.